Chat Live With Kerry King; Springsteen at SXSW? It's been hard keeping a lid on this one as long as we have. No its not another SXSW rumor, though I have a few of those too, and some confirmed stuff as well. No, this involves our namesake reptile web site kingsnake.com and it's 10th annual chat week symposium. Every year we ask famous reptile people to stop by our chat room and talk about their cold blooded pets. Once in a while we get some big name people that cross over from the entertainment industry. This year we had people like Lassie's vet and Animal Planet's Nigel Marvin. In the spirit of saving the biggest for last we have been holding back on the final guest announcement - until now. 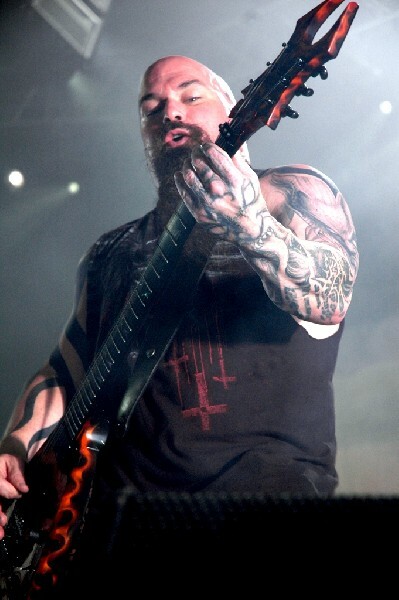 This year our final chat week guest will be Kerry King, lead guitarist for the thrash metal band Slayer. Best known to his many music fans as one of the founders of the seminal thrash metal band Slayer, Kerry has been keeping snakes almost as long as he's been playing guitars. An accomplished reptile breeder Kerry will stop by our site to chat with fans about his snake collection, some of the reptiles he has produced, and what he does with them while he is on tour. The chat will be primarily about reptiles and those that wish to come and just hang out or ask questions are welcome. To check out the chat room go to http://chat.pethobbyist.com/login.php?room_name=Reptile+%26+Amphibian. No special software is needed but you will need to have JAVA enabled on your browser. Kerry's chat is scheduled for Sunday at 8:00pm EST. UPDATE: Kerry has RESCHEDULED HIS CHAT FOR TONIGHT!!! His chat will occur in the same place but will now be tonight (Saturday March 1, 2008) at 10:00 EST. during that period and band mate Little Steven is already rumored to be appearing at this years SXSW.